Lovely Girlie Bits gets Naked! Naked 3 that is! First look with swatches! 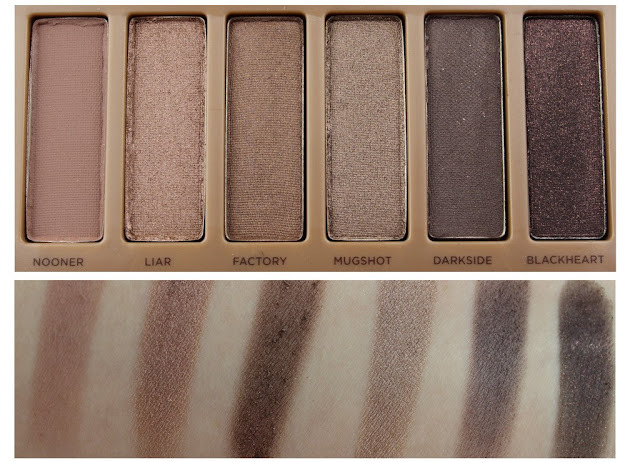 Minds out of the gutter now young ones, for I am talking about the much hyped Naked 3 palette from Urban Decay which has caused quite the stir recently. After that Instagram photo a few weeks ago, everyone was asking if it was real or a hoax and by now you'll know that it's most definitely real! Mark your calendars for December 16th where the latest instalment of the Naked palette will be on sale in Debenhams and House of Fraser in Dundrum for €44. 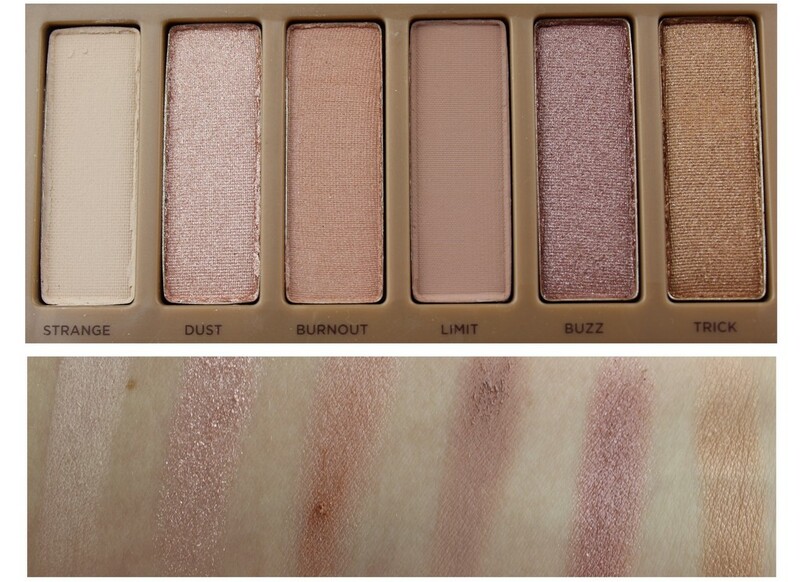 When I saw the first photos online, I'll fully admit that I thought that the palette was going to be too pink for me and didn't think I was going to be too pushed on it. I mean, I love rose gold, but wondered how it would translate in real life. And in real life, the shades are much less pink and much more on the taupe end of the scale which makes moi very happy altogether. 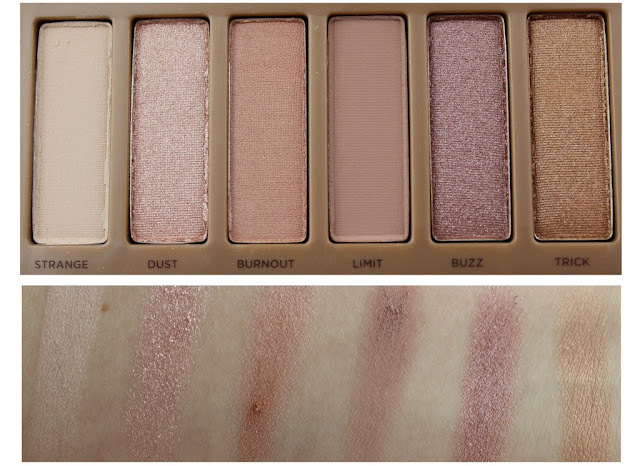 While the original Naked palette is filled with warm neutrals, the Naked 2 takes a cooler toned approach to the neutral eye, but the Naked 3 is back to warm shades, but with a hue of pink to it. And it is just that, a hue. No need to worry about pink eye or look like you've been crying. With a mix of mattes, satins, shimmer and micro glitter and micro sparkle, the palette is full of texture and can be mixed and matched to create lots of looks and as I sit and type, I'm currently sporting two different makeup looks on each eye; one neutral and one dark and smokey. I have also now just realised that I answered the door to someone trying to sell me stuff with two different sets of makeup on my eyes. Lovely. The joys of being a makeup junkie! The left half of the palette contains the lighter shades which are all super soft and beautiful. The only shade that I'm not keen on is Dust because it's so crumbly and has a lot of fall out. Limit and Buzz are my two favourites from this half of the palette and funnily enough are the pinkest of that six! The right hand side of the palette has the darker, smokier shades and this is love folks. Nooner is an absolute cracker of a pinky-brown matte and along with Mugshot, Darkside and Blackheart, I'm sorted for smokey eyes this Christmas. If I'd to pick my two favourites from this side, it'd be Nooner and Blackheart which is a matte black with red micro-sparkle. Oh it's gorgeous! The question on everyone's lips is do I need it if I have the other two? Here are some points and justifications if you are a mad collector like me and need to be nudged a little. You're getting 12 brand new shades which instantly makes it different to the other two Naked palettes which featured existing shades already in Urban Decay's range. Each eyeshadow weighs the same as a MAC eyeshadow, so value for money is truly fantastic. Still on value for money, the palette costs €44 and if you divide that by 12, it works out at €3.67 per eyeshadow. Bargainous. If you collect makeup, it's a no brainer and you shouldn't even be reading this list. The packaging is gorgeous in it's rose gold tin. The shadows are stunning in terms of pigmentation, blendability and wearability. That's a lot of ability, but I can see myself getting lots of wear out of it to be honest. Now, when I met with the ladies from Urban Decay yesterday we laughed at how some poor soul was going to ask for this for Christmas, then have their dad, boyfriend or husband rushing around town on Christmas eve trying to buy them the Naked 3 which they asked for, and end up with a Naked or Naked 2 palette which they probably already own! So ladies, if you really want this, send a photo of it to whoever will be buying it for you so there is no confusion! Then sit back on Christmas day and put it all on, all of it. I'll be doing a video showing the Naked 3 in action very soon, so stay tuned for that. But tell moi, are you tempted to get Naked? Naked 3 that is? The palette is gorgeous - like everything that UD is making. Aghh I don't know!! I already put Vice 2 on my Christmas list and I think Santa may have got it already but now I want this... but not sure I need it... but it's so pretty... but I have no money,,, the conflicted life of a beauty blogger!! I want ALL the Makeup, all of it!! Looking forward to your video. Yeah, I'm gonna be needing this..